In simple terms, failure to file your annual income tax return with the CRA (Canada Revenue Agency) is considered a criminal offence. This is considered to be a form of tax evasion and, as such, can be subject to fines between $1,000 and $25,000 and jail sentences/incarceration up to twelve months. Should you file your returns but fail to pay any taxes owing, the CRA also has the power to impose wage garnishments, without obtaining a court order, or freeze your bank account as a means of collecting the amounts due. Tip: Do not risk prosecution in criminal court. If you have been delinquent in filing your tax returns or are currently in arrears with the CRA, contact a professional debt expert for advice and guidance on how to best deal with your present situation. The financial penalties and interest fees associated with CRA arrears can be quite substantial. 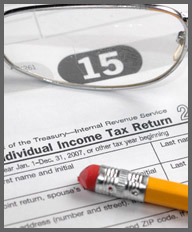 For this reason, it is highly recommended that tax debts are paid off as quickly as possible. If a roll-down repayment plan does not afford the most appropriate solution for your financial situation, you might consult with a mortgage specialist/advisor on the possibility of refinancing your mortgage or perhaps obtaining a second mortgage if the loan-to-value (LTV) ratio of your property is favourable. In addition, since CRA arrears are considered to be unsecured debt (not tied to any assets or collateral), you may have the option of filing a Consumer Proposal or Bankruptcy without having to surrender your home or assets. For self-employed individuals (either sub-contractors or independent operators), filing for bankruptcy will allow you to discharge your income tax and HST/GST debt (through the Bankruptcy Insolvency Act). To discuss a personalized plan aimed at clearing your income tax arrears, contact Natasha Bridgmohan and her team of Toronto mortgage brokers. Call us toll-free at 1-866-553-7467 ext 221 or 905-851-8871 ext 221.